If you fancy yourself a foodie – or even if you just like eating – you would be hard-pressed to find a better place for a culinary vacation, holiday or getaway than the gastronomic mecca of San Francisco. From wine, chocolate and cheeses to fruits from the earth and from the sea, the California Bay Area is known around the world for offering off-the-chart culinary experiences. In part, the genesis of San Francisco’s rich culinary tradition can be traced to its geographic location and easy access to the very best ingredients. If you were to stand atop San Francisco’s highest building (the Transamerica Pyramid, which admittedly would be very difficult to stand atop), a turn of your head would present the Pacific Ocean, the Napa-Sonoma Wine Country and California’s Central Valley. While contributions the first two of those make to the overall dining experience are obvious, some may not realize the latter – California’s Central Valley – is known as “America’s salad bowl” for the abundance of fruits and vegetables that are grown there. In total, California farmers and ranchers produce more than 400 different commodities, and each has its own culinary merits. These commodities, in turn, inspire and supply a stable of talented, creative and visionary chefs. The symbiosis between the Bay Area’s growers, food purveyors and chefs is truly a beautiful thing. As odd as it may seem, the California Gold Rush had a hand in creating San Francisco’s culinary prowess, too. As dreams of opportunity and prosperity brought immigrants to the state in the mid-1800s, those new residents’ different backgrounds – representing ethnic cultures from all over the world – laid the foundation for a unique culinary diversity that is still very much apparent today. There are many ways to enjoy a San Francisco culinary vacation, and probably the easiest is to just do a little research and pick out a few restaurants to try while you are here. You may want to check the California Restaurant Weeks article to see if your trip coincides with any of those dining opportunities. You may also want to do a search for the type of food you enjoy the most and the area of the city where you plan to stay – e.g., do a search for “San Francisco Union Square Italian restaurant” (without the quotation marks) — and then check out some of the results. 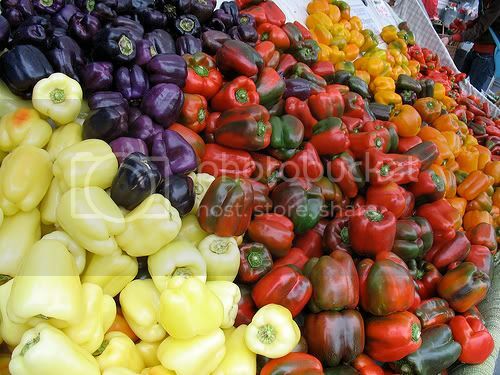 Photo of peppers of all colors at the San Francisco Ferry Building Farmer’s Market by maveric2003 via flickr (Creative Commons).